Eyeshadow palettes. New, novelty, limited edition, with cocoa scent, coconut scent, with Kardashians, Youtuber collaborations, mattes, shimmers, sparkles!! Buy me! Buy me! Buy! Meeeee! Ugh. Don't you just get overwhelmed with the amount of eyeshadow palettes on the market? I think it was the Urban Decay Naked palettes that started the craze a few years ago, at least I can't recall anything as iconic before them. Now new palettes are launching left and right every single day, it's almost impossible to keep up with the new launches. For me as a blogger this is both exciting and annoying as the bulk of new releases are limited editions: there's always something new to write about, but once they are gone, I can't really recommend them. Today I'm sharing some eyeshadow palettes (bigger than quads) I've sold or gifted away and why didn't they work for me. If you see your favorite palette here, don't mind about me - I'm happy it works for you! My very first real "makeup palette". Oh how I loved my Naked 2, it was like a gateway-drug to other palettes; namely Naked 3. This palette was getting old and I couldn't get on with the glitter textures, so it was time to let it go. I could've kept it for sentimental reasons, but to keep my collection small (HAH!) and neat, I decided against. This palette was love at first sight with its rosy tones and while I liked some of the shades the glitter textures just didn't work out for me. Besides, I was getting tired of Urban Decay as a brand once their novelty factory died. I gifted this to a better home! Again, love at first sight. This palette had pretty good textures and pigmentation, but I just didn't find myself reaching for it. I had found the attraction of luxury palettes (Burberry, Tom Ford, Viseard) and there was no going back to middle-market chocolate smelling shadows. To be honest, I had forgotten I ever owned this palette. While I like adding intensity to my shadows by wetting the brush, I don't think I ever fell in love with the shade selection. I'm one of those people who need a matte crease color no matter what. None of the palette colors seemed too special for me and at the time I didn't understand appreciate the look of blue or black eyeshadow/liner. Never reached for it, so in a better home it went. I kind of regret letting go of this Natasha Denona palette. I keep wondering could I have done more with it, a different technique or used a different brush? I got this in a Beautylish Lucky Bag and the color selection was right up my alley. Quality-wise it was good, but I quickly decided I wouldn't use this palette too much. Once I was in the purge mode I only kept palettes that bought me instant happiness and satisfaction. If something didn't "click", it was out - and Natasha got a new home. Now here comes the oddball! First of all, I LOVE Viseart! My gorgeous Parisian friend introduced the brand to me a couple of years ago and I fell madly in love with the colors and quality of the products. I need to do a separate rave post for my Viseart collection. So, why did I let go of 01 Cashmere palette (review here)? It's compact, the mattes are top quality, pigmented and blendable with okay shimmers. Somehow I found the middle shimmer shade a bit stiffer and not really a complementary color on my lids. While I loved Cashmere's mattes and shimmery highlighter shade, Cashmere didn't excite me enough as I already had similar colors in my larger palettes. When I'm doing my makeup at home I would grab my 1 Neutral Mattes instead and combine it with 5 Sultry Muse or 6 Paris Nudes for a pop of shimmer. I decided to sell Cashmere but keep and depot the warmer Theory palette in 02 Minx, which I find more complimentary for my eye color. For me, this is a complete palette with a beautiful range of lights and darks, mattes and shimmers. If you're into plums - this is a palette for you. While I don't reach for it too often, every time I take it out I remember why I liked it in the first place. This palette gets way too little love online - it's basic, but very good quality. I think it was supposed to be a limited edition a couple years back, but I've still seen it sold online. Conclusion..? I won't be buying big eyeshadow palettes any more. For some reason I get bored of them after a while and there's always a couple of shades won't work for me. They're big, clunky and often not worth the hype for me. I much prefer quads, singles, my depot palettes and Viseart pro palettes that are made for mixing and matching. I've decided to only pick up makeup I'm interested in my personal life and see if they're worth blogging about. While I do dream about a big Natasha Denona palette to give her one more chance, I don't see myself investing right now. 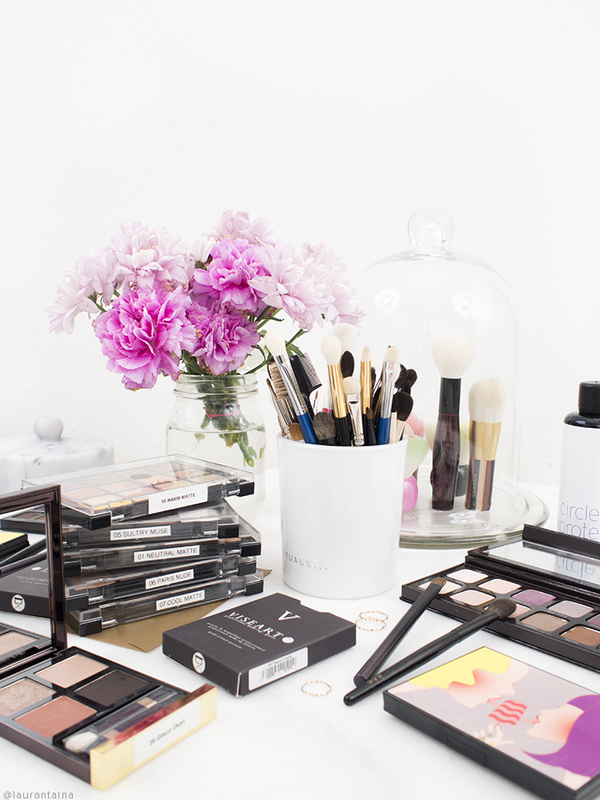 Viseart is a small French professional make up brand that has become very popular during the recent years. Their innovative formula is designed to be high performance without harmful ingredients. Viseart has 12-pan concealer, lipstick, eyebrow and eyeshadow palettes with and minimal, clear packaging. The eyeshadow palettes come in either matte or shimmer finish with a large range of colors you can mix and match. In Spring 2016 Viseart came out with 3 smaller Viseart Theory palettes (Minx, Cashmere and Chroma) that mix both matte and shimmer finishes for creating a look with a single palette. I was introduced to Viseart by my dear friend and soon I went crazy about these palettes. As soon as I saw there would be travel-friendly versions I was overjoyed. The Theory palettes are half smaller 6 pans and 12g/0.42oz vs 12 pans and 24g/0.84oz and retail 41€ (12 pan palettes 73€). Today I'll show you Cashmere! Unlike the large Viseart palettes, Cashmere comes in a cardboard sleeve, flap with a magnetic closure and a thin plastic cover to protect the shadows. I'm quite neutral about the packaging, don't love it - don't hate it. A traditional see-through cover would have been more convenient if you buy more than 1 of the Theory palettes. Why change it? If you're unfamiliar with Viseart think about perfection. Pigmented, soft shadows that blend effortlessly, last long on the lids and have no fallout. Maybe you have a brand in mind that ticks all the boxes. OK then, keep that thought, now, think about better. For many brands the mattes are difficult to formulate. Viseart mattes are pigmented, buttery soft and blend like a dream. The application is effortless as they glide on the skin without skipping or applying patchy. They stay put for the rest of your day. Simply exquisite. The shimmer shades are beautiful and usually apply in a similar manner, but the mattes are truly exquisite. Cashmere would be a perfect performer if there wasn't one mediocre shade: the middle champagne shimmer. It applies sheer, stiff, there's a prominent fallout as the shimmers won't stay intact but fly everywhere. I was so confused, this is unlike in any Viseart palette I've seen. The 1st shimmer shade is buttery and pigmented, a joy to apply, but for the 2nd I need to rub my brush in the pan. I spray my brush with Fix+ and I get a decent, pigmented application without fallout from the champagne shimmer, but this is not how a Viseart palette should perform. The 3rd shimmer is okay, but not as buttery as 1st the pearl one. Make up of the day wearing the Cashmere Theory palette. Highlight is THREE Shimmering Glow Duo (review), lipstick Charlotte Tilbury Hot Lips Tell Laura (review). I really like the neutral-warm mattes in the crease and shimmers on the mobile lid. I gave some harsh critique on the Cashmere palette's shimmers, but I have very high standards to Viseart and my eyeshadows. Despite one mediocre shade, I love the vanilla shimmer and the mattes - they will leave you amazed and wanting more. I do like and recommend this palette if you're looking for a nice, travel-friendly neutrals with an attractive price. My other recommendation would be the Burberry Mocha quad (subtle shimmer) or Rouge Bunny Rouge Antigo (satin finish). 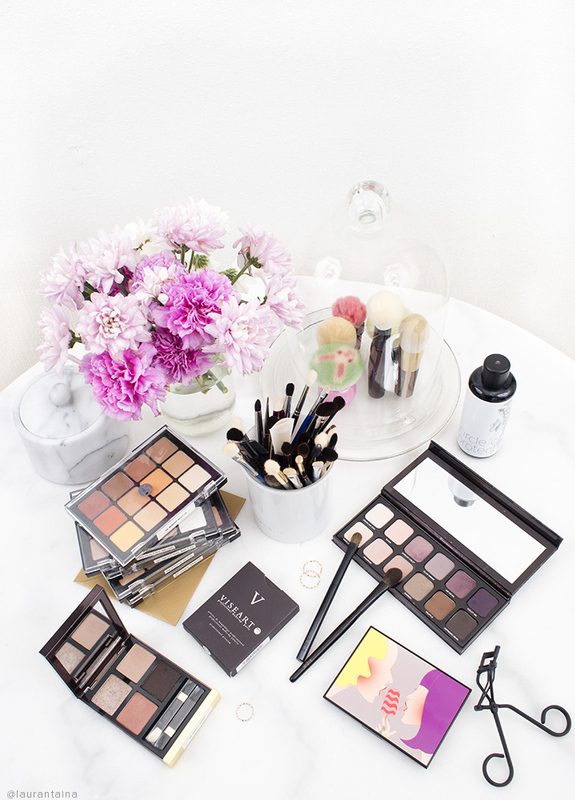 Have you tried Viseart palettes? Are you tempted to?